Brock CareerZone Blog: Lights, Camera, ACTION! So you've decided on your career path. You know the field you want to work in, and you perhaps have an idea of where exactly you would like to start your journey into the field that interests you. So now what? 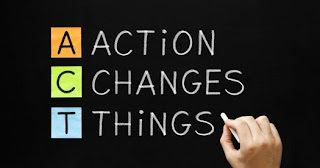 Now, it's time to take action! There are many ways to take action at this phase of the career planning process; but ultimately, you want to begin with finding the position or job which speaks to your passions and your skills. As exciting as it is when you find the position of your dreams, paying careful attention to the job posting itself is critical. This is where tailoring comes in! And no, I don't mean taking your pants to get hemmed! Tailoring both your resume/cv and your cover letter to the position you are applying for is extremely important and will immensely increase your chances of landing an interview. When employers see that you have critically reviewed the job posting and incorporated this with your own experiences, you automatically make a good first impression! And in the job market, first impressions could be the difference between landing an interview or being rejected altogether. For example, if you are reviewing the posting and the word "organized" is listed, perhaps this is an important skill in relation to the job which you should be highlighting throughout your resume and cover letter. After you've done the following, your phone rings and it's a recruiter looking to arrange an interview for the position you applied for! HOORAY! This is where the action continues! When preparing for the interview, be sure to come up with some practice questions which you think they might ask you, and utilize tools like Interview Stream, a program which allows you to see how you look and sound when answering interview style questions, to identify areas in need of improvement, like mumbling or fidgeting. Doing a bit of research about the company in question may also allow you to come up with some questions of your own to ask during the interview. Additionally, make sure you are dressed professionally; if you'd wear it to the gym, it's probably not appropriate for an interview! The action phase is probably the most exciting in the career planning process, but can also be devastating if you do not receive an interview or an offer of employment. To finish, keep your head up and understand that this process usually doesn't happen over night! Rather than letting rejection get you down, utilize it to do better and ask for feedback from jobs you didn't get so you can continue to improve. And don't forget to come on down to the Career Resource Centre if you'd like us to help you with the action phase! We are always happy to assist with tailoring and interview preparation, and love hearing success stories!